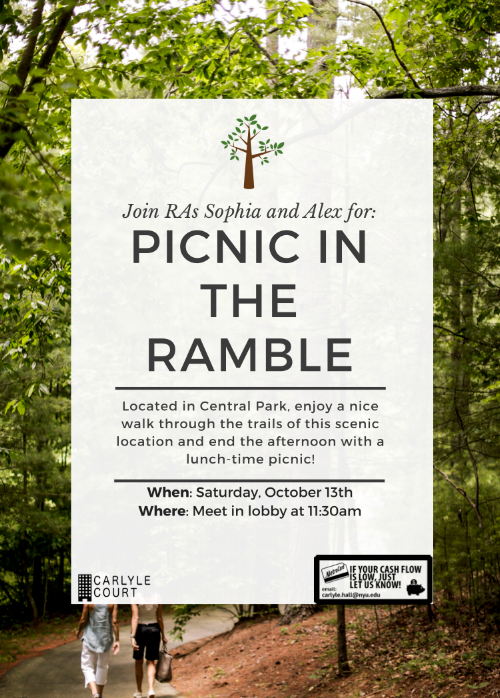 Join RAs Sophia and Alex for a picnic and walk in the Ramble in Central Park, followed by a lunch-time picnic. Described by Frederick Law Olmsted as a "wild garden", the Ramble's maze of trails amidst its abundant flora and fauna contrasts spectacularly with the formality of nearby attractions. The walking route is about 1.5 miles and will take around 2 hours.